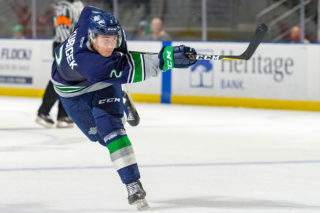 PORTLAND, March 17, 2019 — Six different T-Birds scored Sunday night at Veterans Memorial Coliseum as the Seattle Thunderbirds defeated the Portland Winterhawks 6-5 in the last regular season home game for both teams. 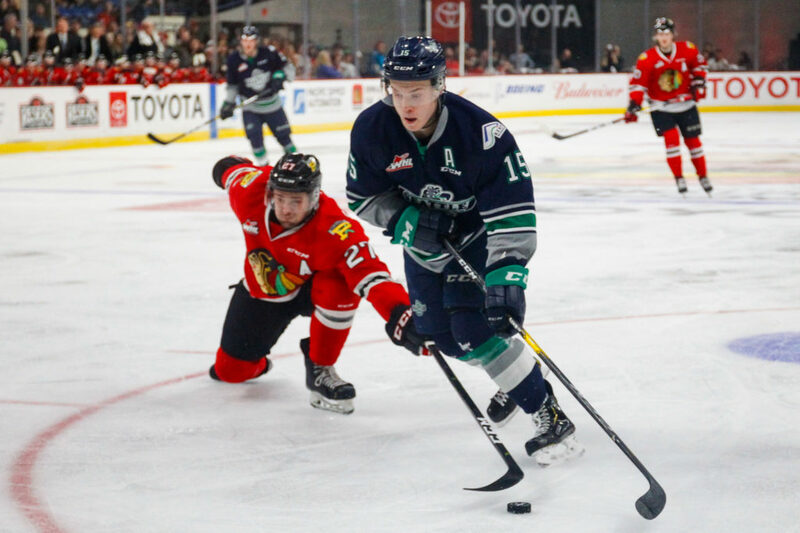 The T-Birds will play the Vancouver Giants in the first round of the 2019 WHL Playoffs. The best-of-seven series will start with Game 1 on Friday, March 22, at Vancouver at 7:30pm. Single game tickets for the first round series against Vancouver will go on sale Monday, March 18, at 10am on the T-Birds website and at the accesso ShoWare Center box office. The box office is open Monday through Friday 10am to 5pm. 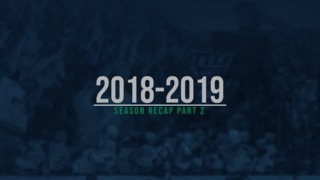 The T-Birds finish the 2018-19 season with a 31-29-6-2 record. The T-Birds won 20 of 34 games in the second half of the season. 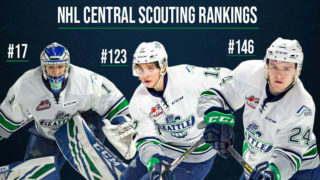 They head into the 2019 WHL Playoffs with wins in six of their last seven games. Cole Schwebius stops Joachim Blichfeld in the second period with a blocker save. Seattle goalie Cole Schwebius was very good in net against Portland making 39 saves. 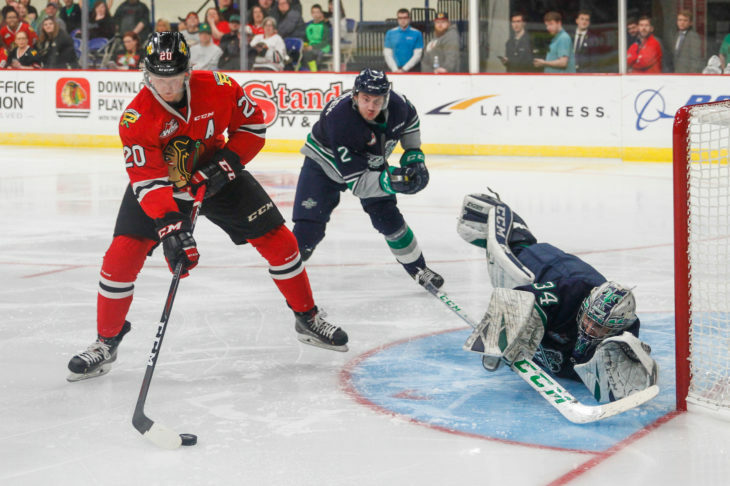 Schwebius stopped Portland’s leading scorer, Joachim Blichfeld, one-on-one 2:50 into the second period, with a sprawling blocker save that kept the T-Birds, who were trailing at that point, within one goa of Portland. Portland took a 2-0 lead early in the first period on goals by Reece Newkirk at 1:47 and Jake Gricius at 5:35. Graeme Bryks had the puck on the left boards and threw it on net. Portland goalie Joel Hofer made the save but Jared Davidson was at the left post to sneak the rebound past the goalie at 10:32 for his second goal of the season. Kai Uchacz scored his first career goal, at 13:03 of the first, to tie the game 2-2. Henrik Rybinski had the puck on the left wall and found Payton Mount all alone in front of Hofer. Mount was stopped on an attempt by Hofer’s right pad. But Uchacz came in and cleaned up the rebound by putting it over the goalie. Seattle took a 3-2 lead on a power-play goal by Simon Kubicek at 15:14 of the first. Bryks won a faceoff in the left circle back to Kubicek at right point. Kubicek beat Hofer with a slap shot with traffic in front of the goalie for his ninth goal of the season. Portland took a 4-3 lead late in the first on goals by Clay Hanus at 15:56 and Seth Jarvis at 16:50. Brecon Wood tied the game 4-4 for the T-Birds at 4:27 of the second period. Uchacz had the puck behind the net and sent in front where Andrej Kukuca took a shot. The puck came off Hofer’s left pad to Wood. Wood lifted a backhand shot into the top right corner of the net as Hofer tried to get over for his fourth goal of the season. On the power play Sean Richards got behind the defense on a pass from Kukuca. Richards came in on Hofer and beat him high at 5:30 for his 15th goal of the season. Jarret Tyszka had the second assist. 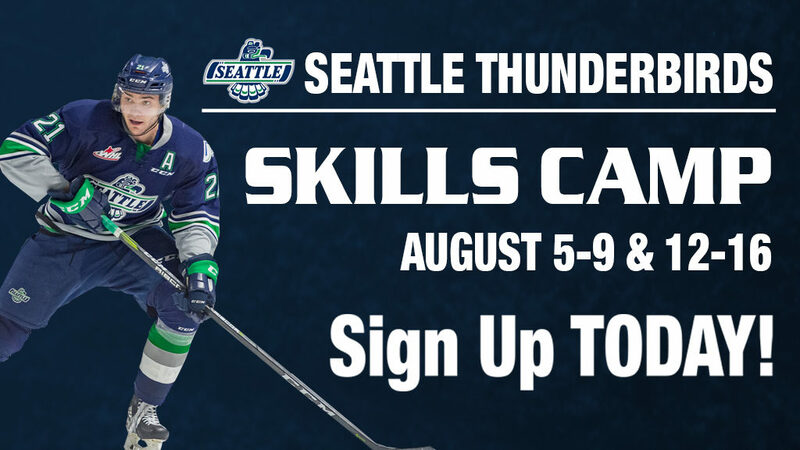 At the eight-minute mark Tyszka hit a wide open net to make it 6-4 Seattle. Kukuca was in the right circle and made a wrist pass to Jaxan Kaluski on top of the crease. Hofer went down thinking show and the puck deflected off Kaluski’s skate right to Tyszka in the slot. Hofer was down and Tyszka had the whole net to shoot at and didn’t miss. Shots on goal – Seattle 9-15-9 33, Portland 17-13-14 44. Goalies – Seattle, Schwebius 44 shots-39 saves (5-8-2-0); Portland, Hofer 33-27 (15-29-3-1). Power plays – Seattle 2-3; Portland 2-4. A – 8,862. Referees – Kevin Bennett, Stephen Campbell. Linesmen –Eric Freeman, Tim Plamondon.